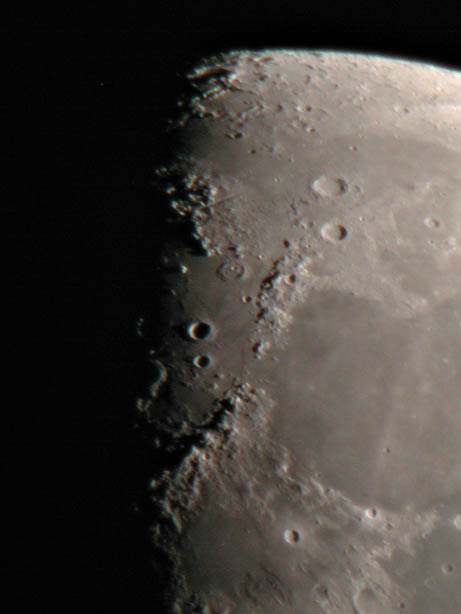 • Telescopic moon photos from new crescent through last quarter. 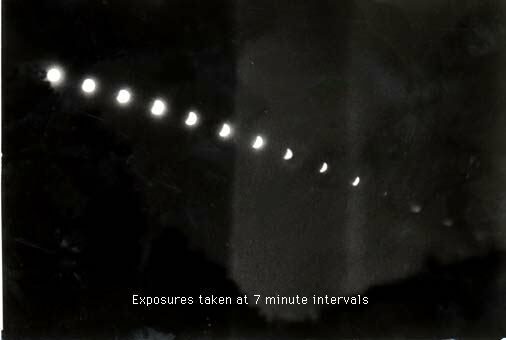 • A 3-1/2 week time-lapse movie of the phases of the moon. 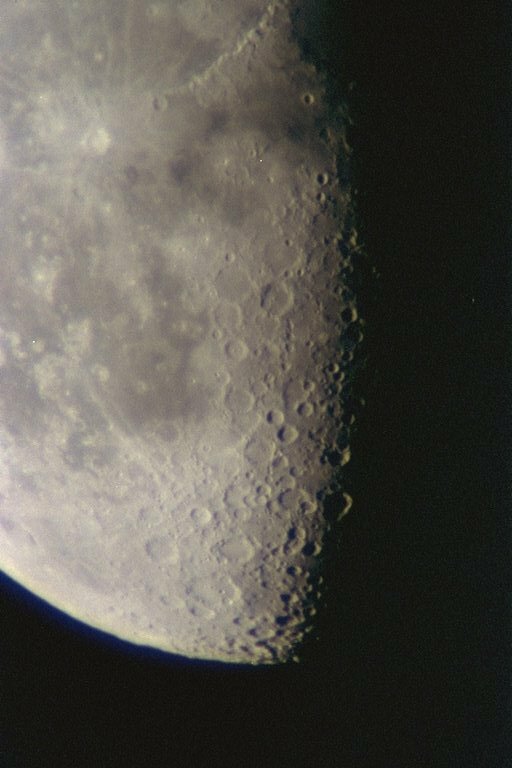 • A movie of the moon setting through the telescope. • What is a Blue Moon? 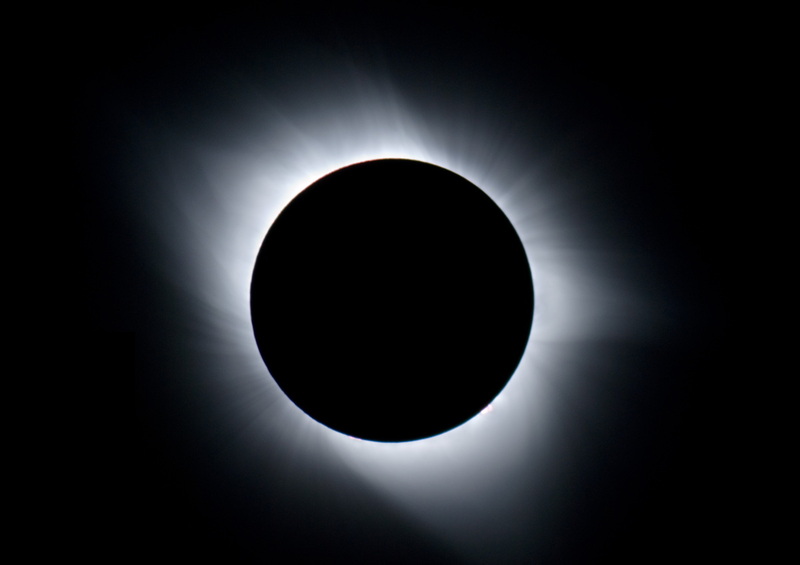 • See a rare Stellar Eclipse! • Is the moon really larger on the horizon? 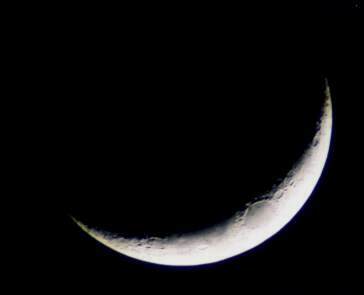 • The Moon Below the Equator is upside down! 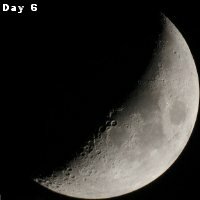 Read about my lunar photo technique and my photo equipment. 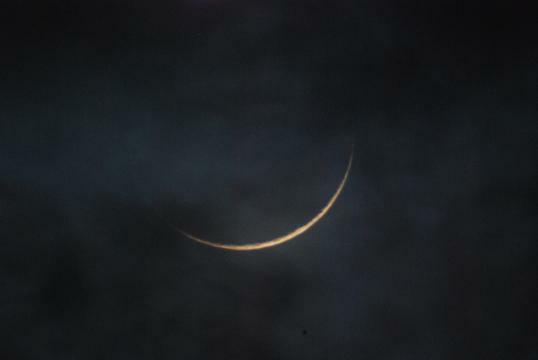 A really new moon, only 6 hours old. This moon sets just after the sun. The same moon, 24 hours later. 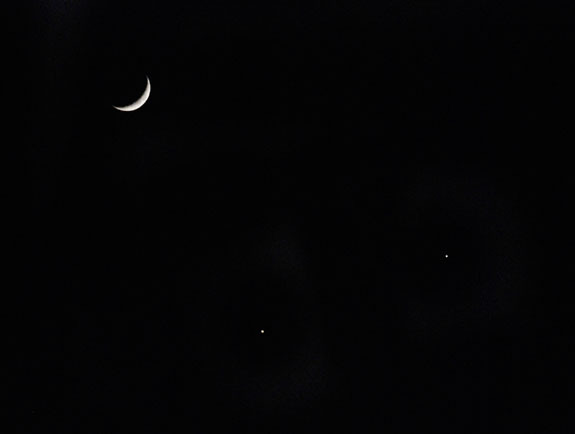 The Moon, Venus and Jupiter on December 1, 2008 forming a "frowning face". In the southern hemisphere a "smiley" face was formed. 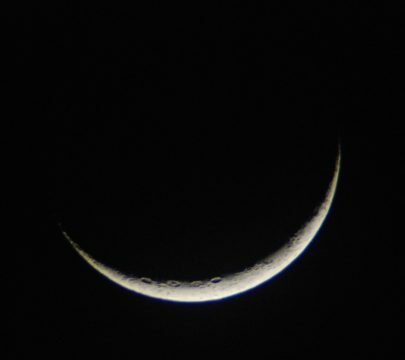 Another new crescent, but getting larger. 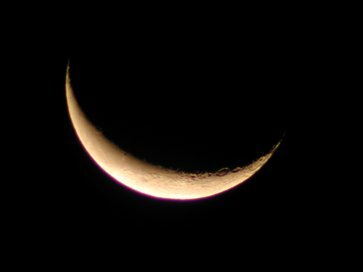 When the moon is new, the bright earth reflects back and illuminates the disk. 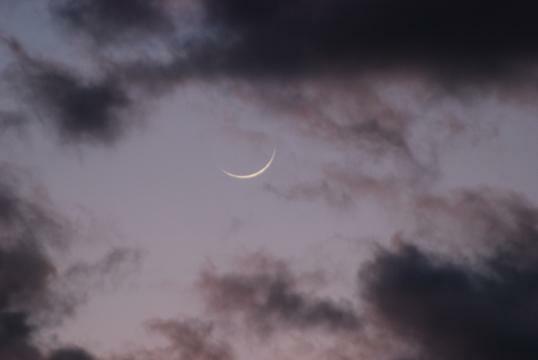 This is often called, "Old moon in the new moon's arms." 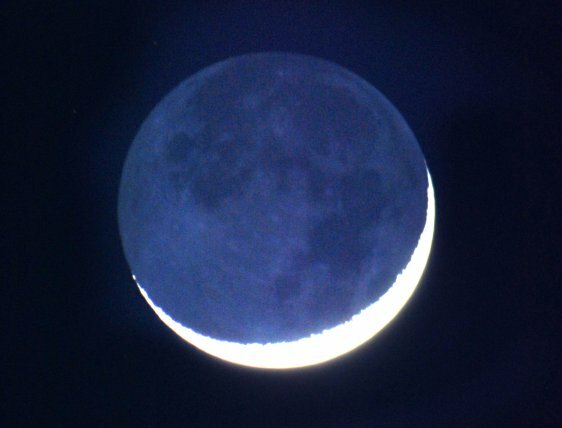 A very cool animation of a new moon with earthshine setting behind some columns. 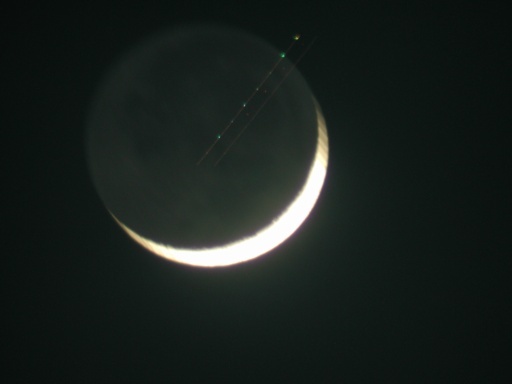 Here is a unique photo of a Jet Plane flying through the Earthshine. 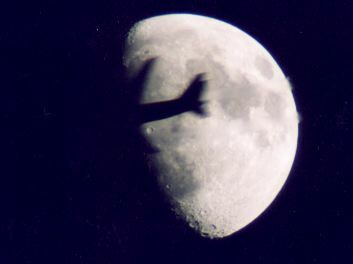 A lucky shot of an airplane transiting the moon. 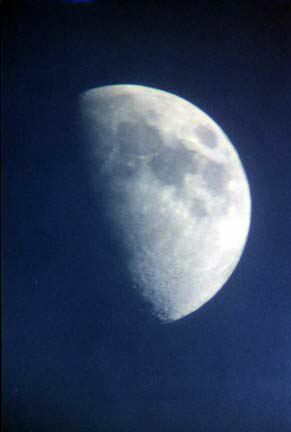 A digitally enhanced 6-day moon against the blue sky. Here is a series taken on four consecutive evenings around first quarter. 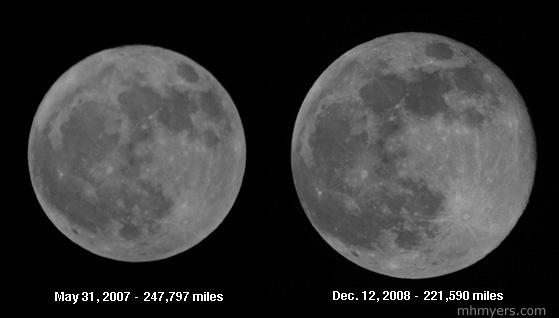 Note the changes from night to night. Here are four more consecutive evenings from 7 to 10 days old. 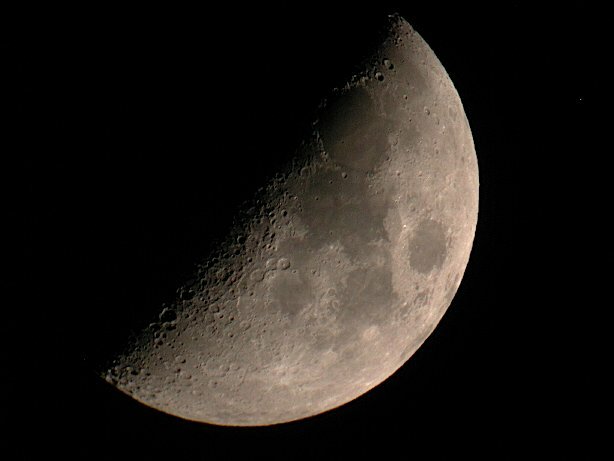 A 3-1/2 week time-lapse movie of the phases of the moon. 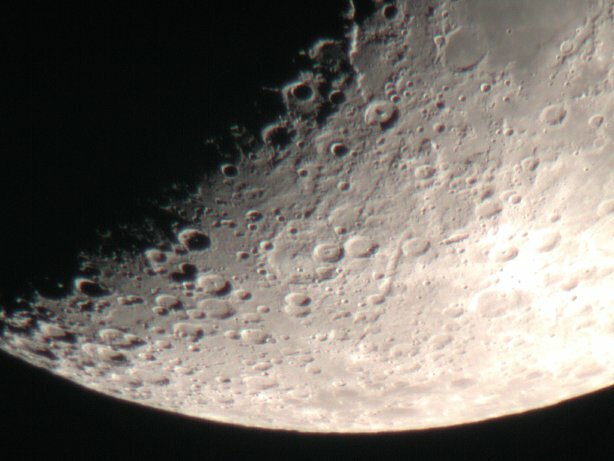 A 6-day moon, wide angle and close-up. Digital photos. 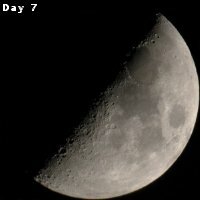 The next evening: a first quarter, or 7-day moon. The next night, an 8-day moon. 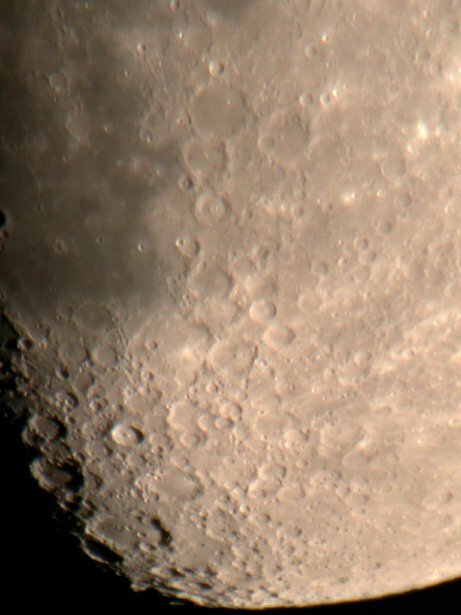 The smallest craters you can see are about 5 miles across. to see the changes in 24 hours. showing a quarter moon setting behind these cliffs at Zion Canyon in Utah. A composite photo of the moon, Saturn, Venus and Jupiter taken on April 28, 2004. Here is a page with more photos of the planets. After first quarter, just before sunset. 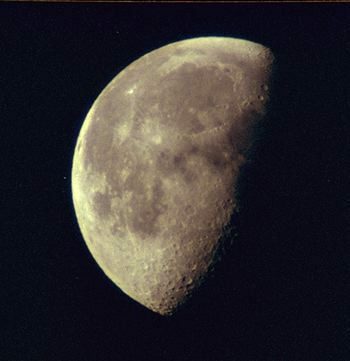 Here are two views of a 10 day old moon, taken moments apart. 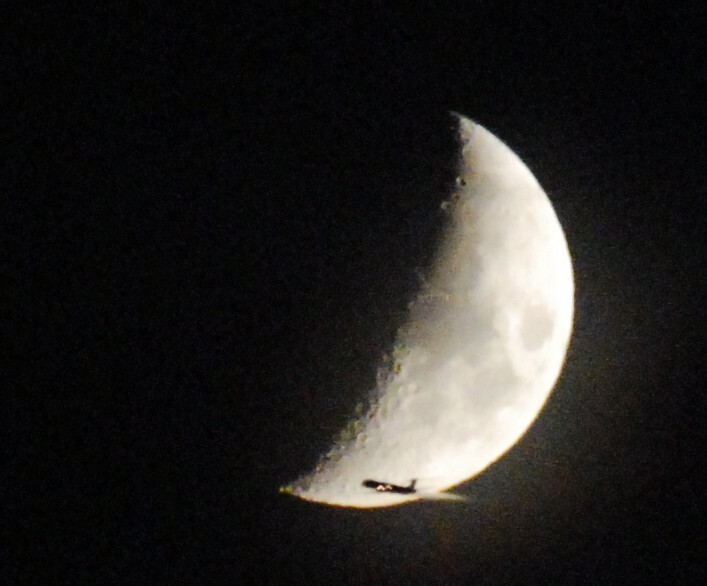 The second photo caught an airplane flying across it! 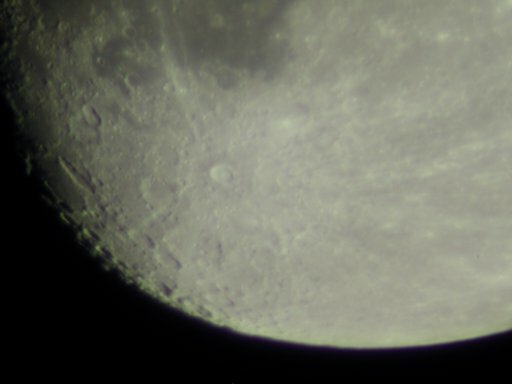 Here is a short real-time movie (518K) taken through a telescope. The movement demonstrates the rotation of the earth. 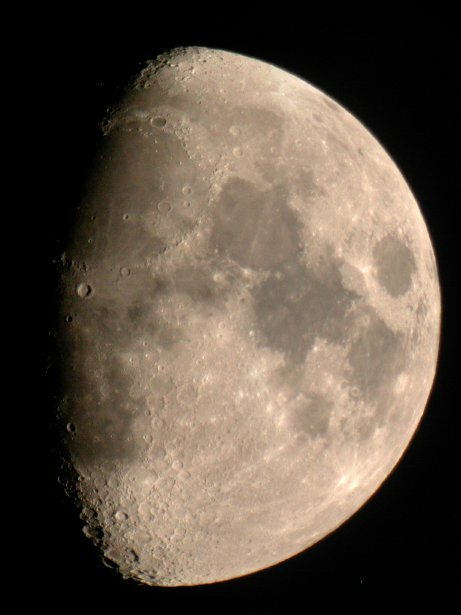 A 12-day moon, taken a day after the movie above. 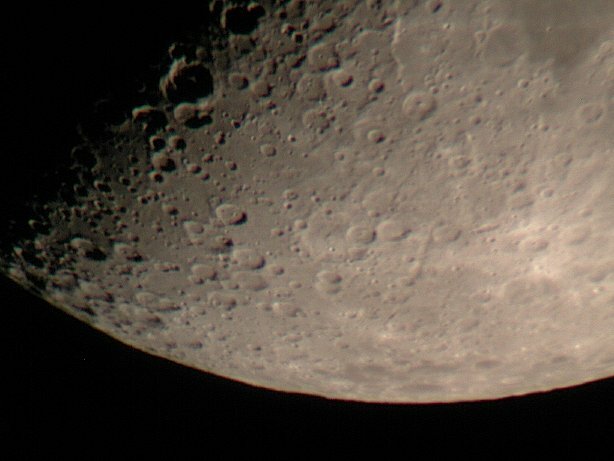 The bright deep crater is named Tycho. Digital image. 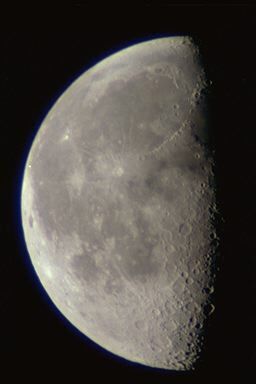 A 12.5 day moon, taken with more modern equipment. 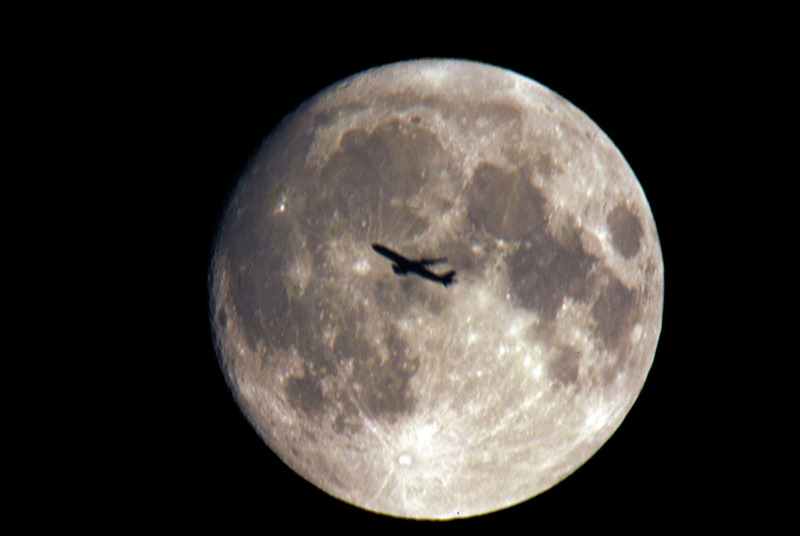 A 98% full moon with a perfectly centered jet plane flying across it. The photo is 100% genuine, I was very lucky to catch this moment. 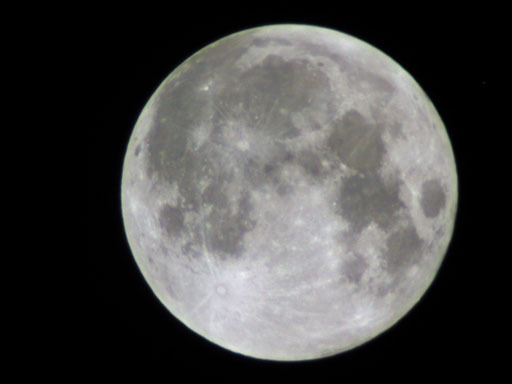 A full moon is brilliant, but you don't see any craters. The full moon rises just as the sun sets. A full moon rising behind a tree. Neat picture! 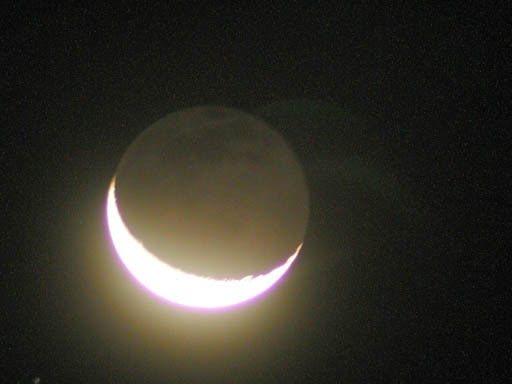 Note how the moon appears flattened when it is close to the horizon. 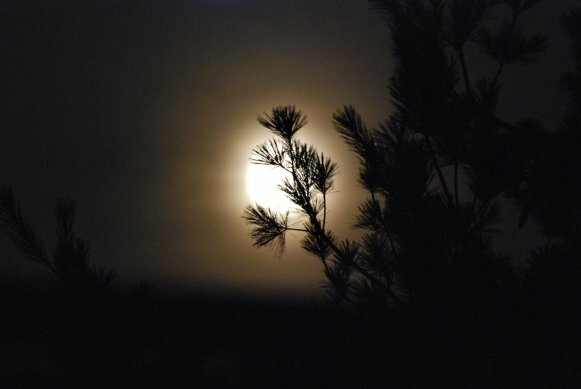 A full moon rising behind a pine tree. 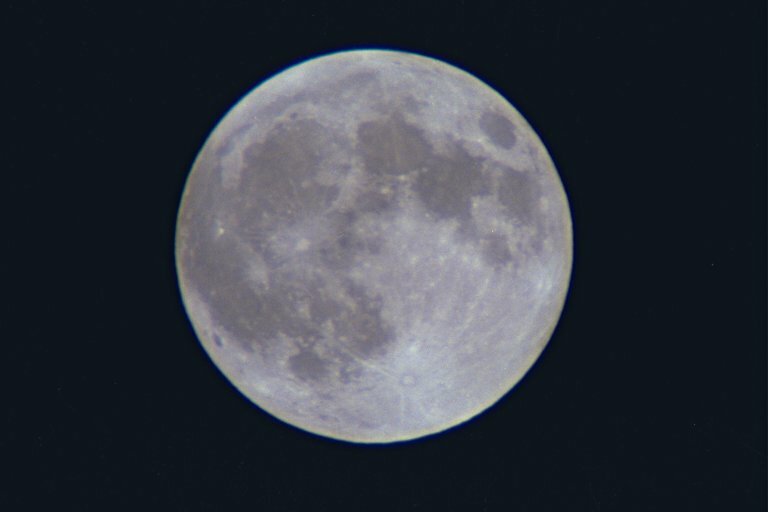 Here is the full moon at perigree, when it is closest to earth, much larger and brighter than usual. 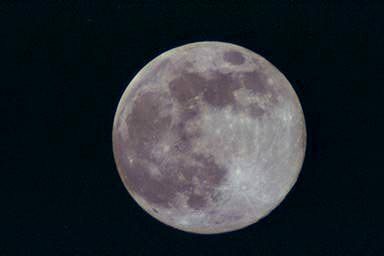 When the moon is closer to earth, it appears larger and is called a Supermoon. These photos show the relatively small difference in appearance depending on the distance from earth. 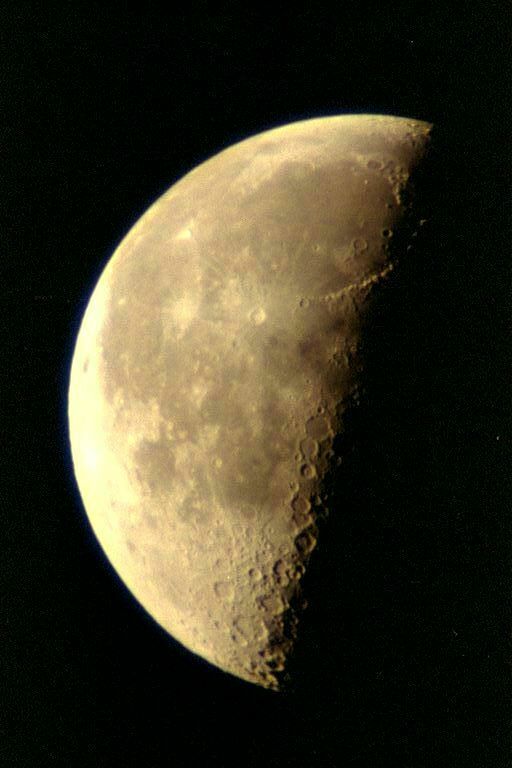 Both images were taken with the same camera and lens magnification. 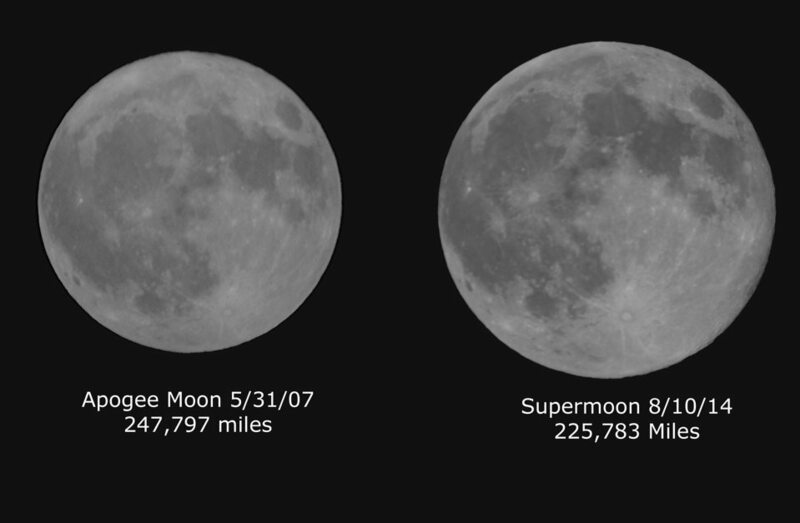 Here is the "Supermoon" from August 10, 2014 compared with a full moon that was at it's farthest point from earth. You won't find one much rounder than this! 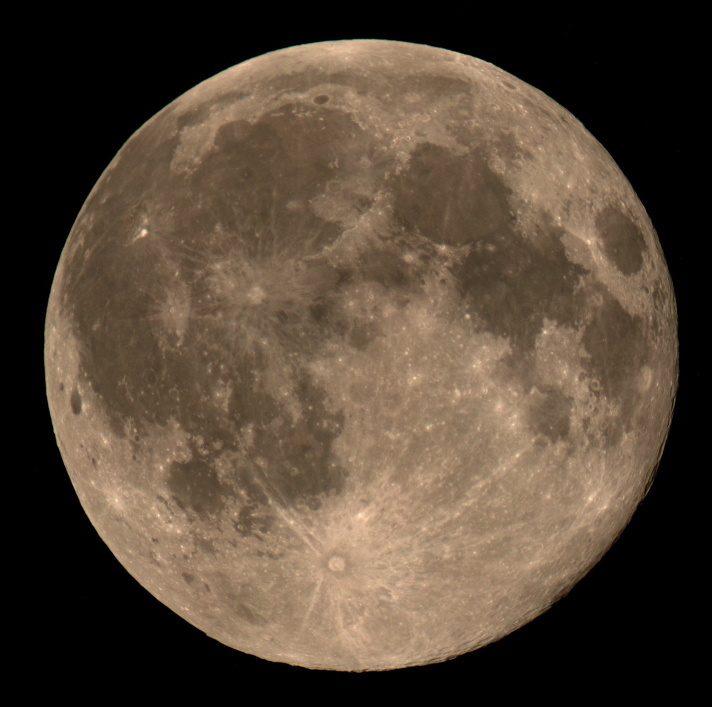 The Harvest Moon, the full moon closest to the vernal equinox. This is reduced from a 32 Megapixel image. Here is the same photo next to a crop from the full-sized image. The full moon next to Mars on December 23, 2007. This is a good illustration of the relative size of each. Mars is the red dot. Move your mouse over this image to see the difference in 24 hours. 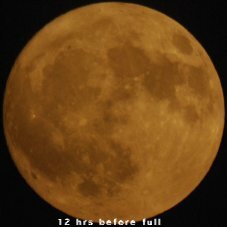 The change around full moon is more subtle. The color difference is due to the atmosphere. 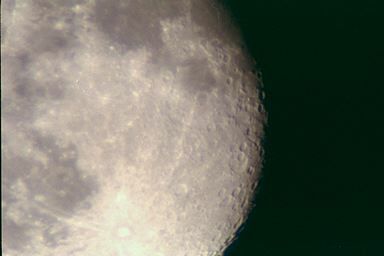 This moon is just 5 hours past full and you can already see some loss of roundness on the right side. 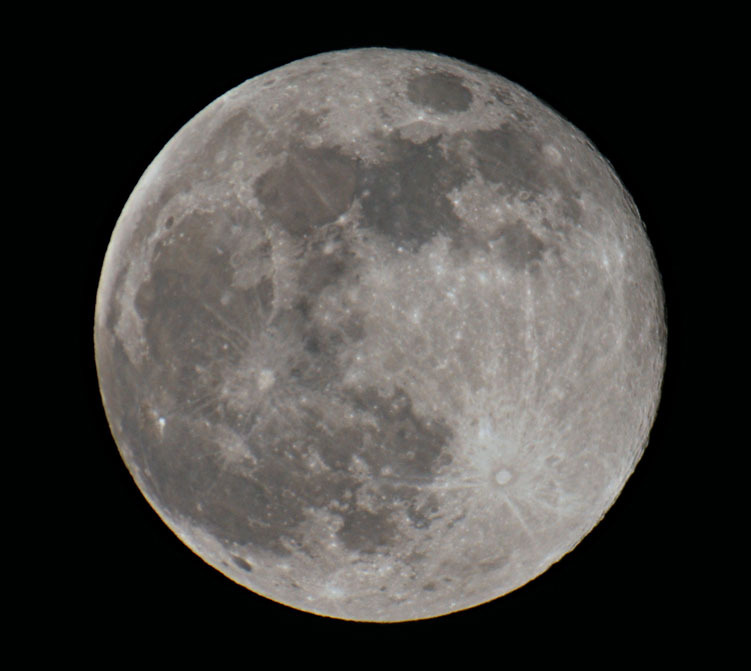 Here is a link to more full moon photos. 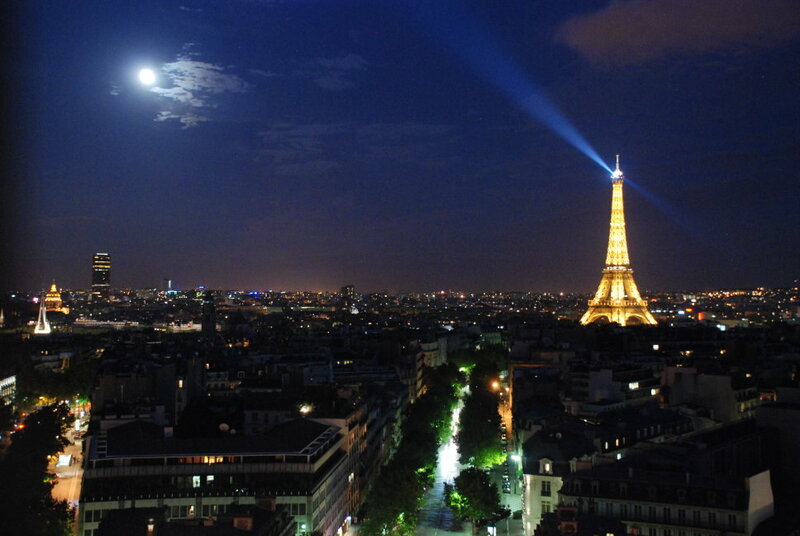 Moonrise over the Eiffel Tower in Paris France. 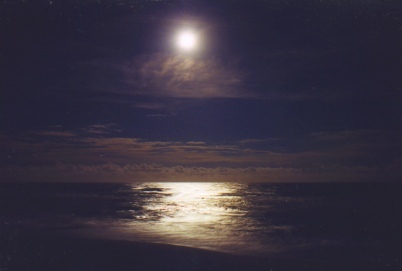 Moonrise over Cape Hatteras on the Atlantic Ocean. 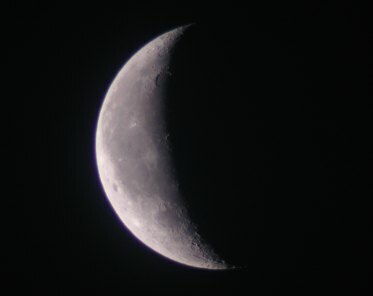 A waning moon, 2 or 3 days past full. 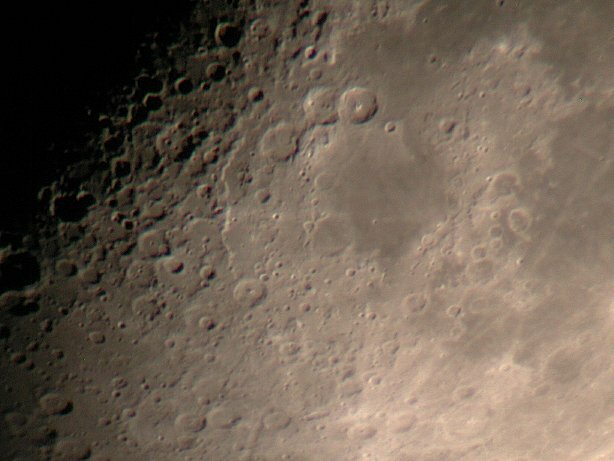 About a day before 3rd quarter at 4000mm. 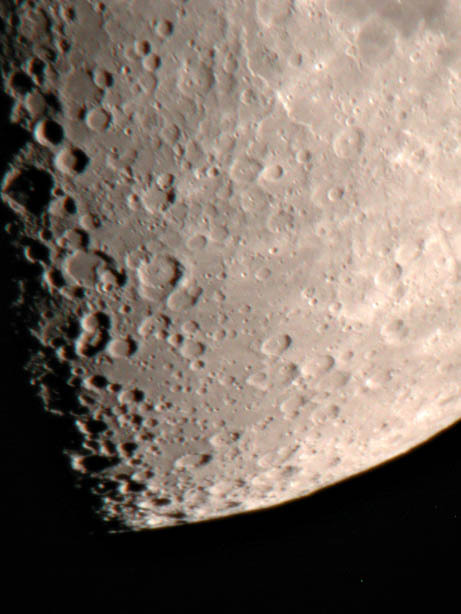 Look at the detail in those craters! 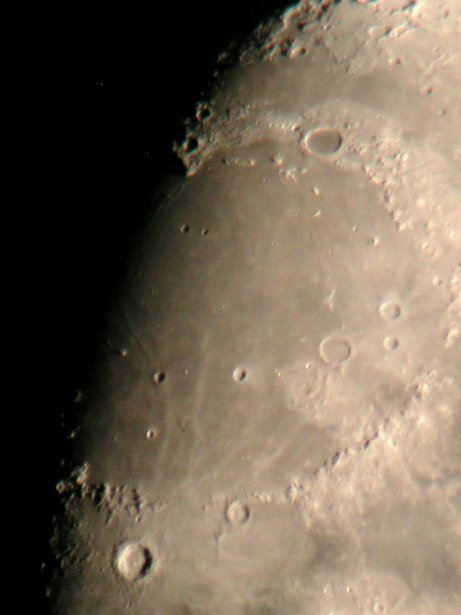 Same moon as above, but a wider angle. A beautiful last quarter, which rises at midnight. Don't miss this one- the thumbnail doesn't do it justice. 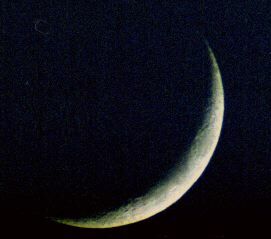 A 23 day old moon. 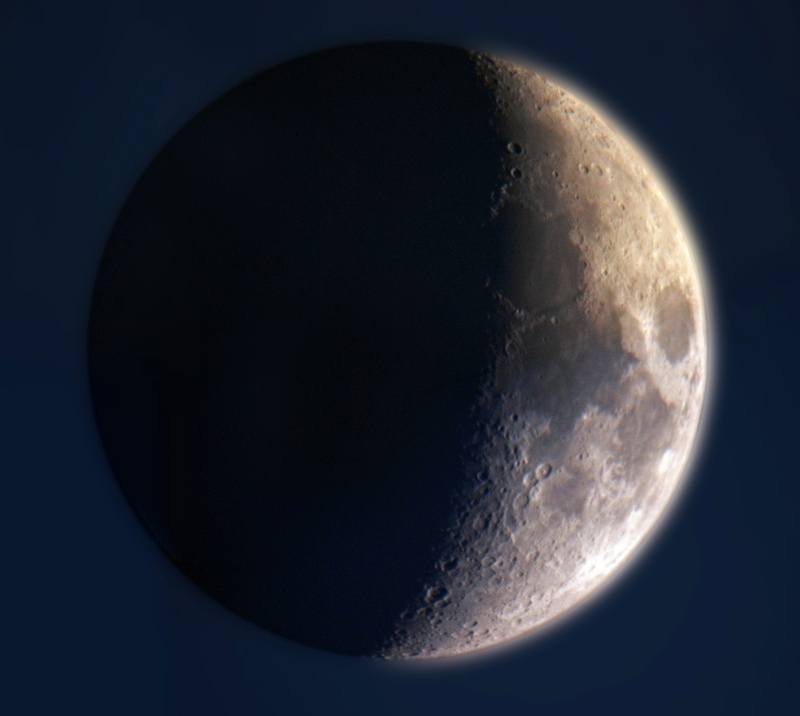 This moon is exactly 24½ days old. 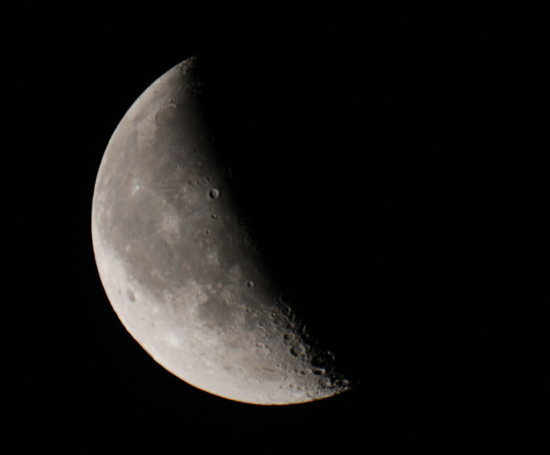 A waning, 26 day old moon. These photos were taken at 5 am as the moon was rising. 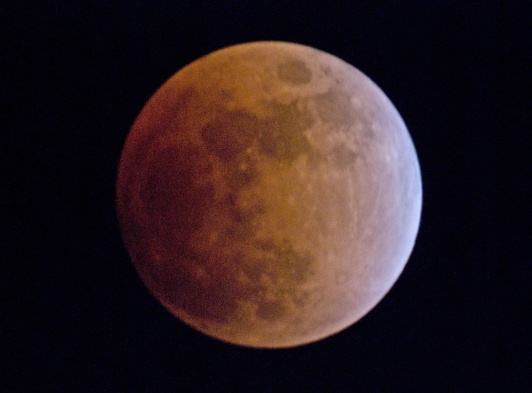 The "Blood Moon" Lunar Eclipse from January 21, 2019. 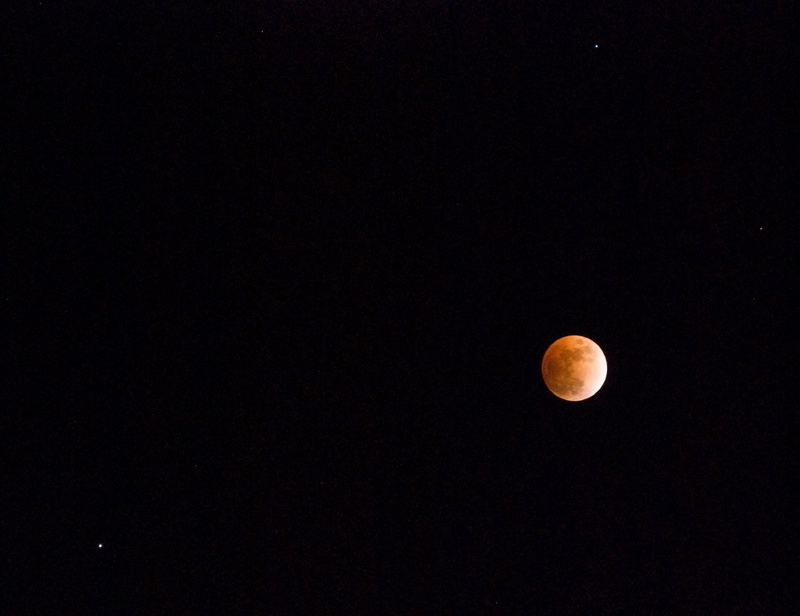 Two photos from the February 20, 2008 Lunar Eclipse. 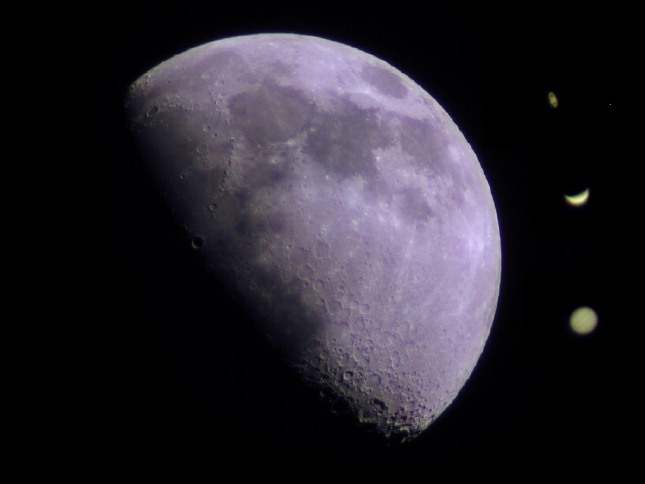 The second photo shows Saturn (to the left) and Regulus (above) the moon. 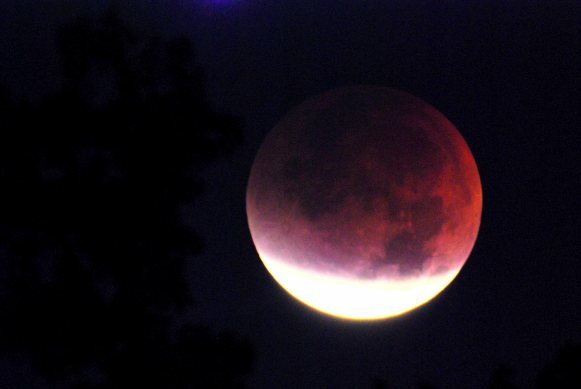 The Lunar Eclipse from August 28, 2007. Totality occurred as the moon was setting at sunrise. Here is a page with more eclipse photos from that morning. Here is an animation of the Lunar Eclipse on March 3, 2007. 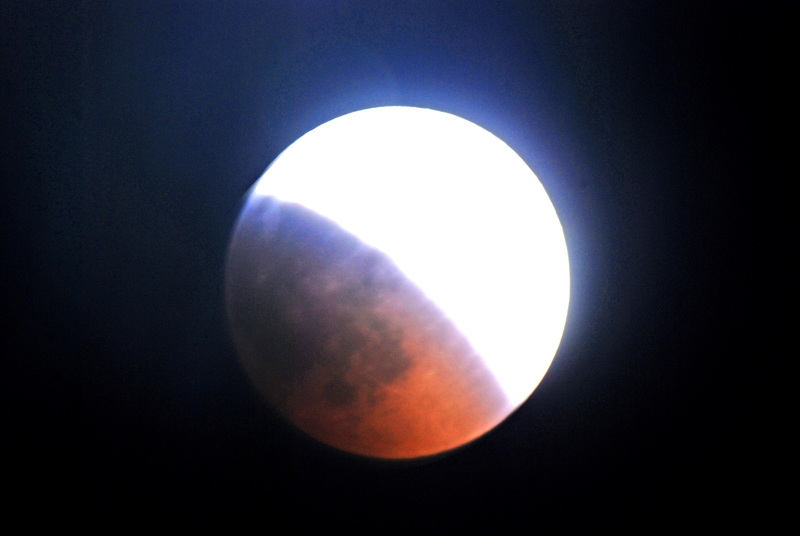 Here is a page of photos of the Lunar Eclipse on November 8, 2003. 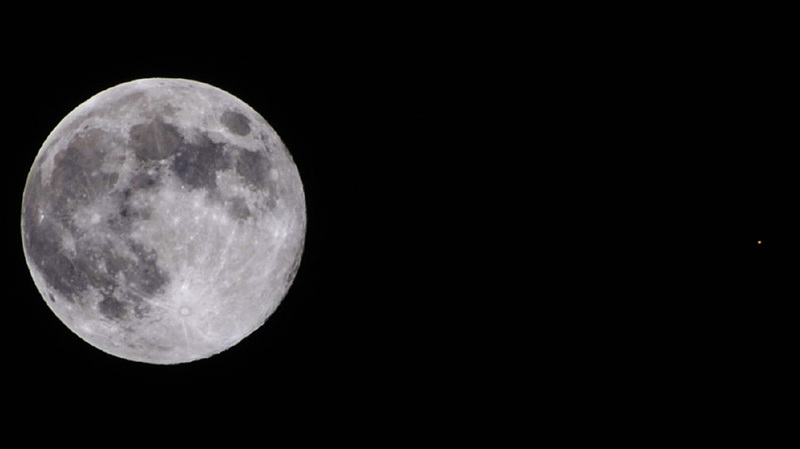 There is more than one definition of the term, "Blue Moon." 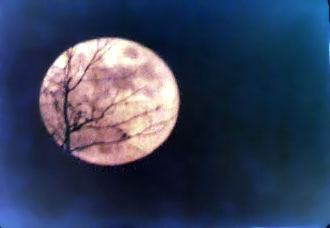 To learn more and see some photos of blue moons, visit the Blue Moon Page. 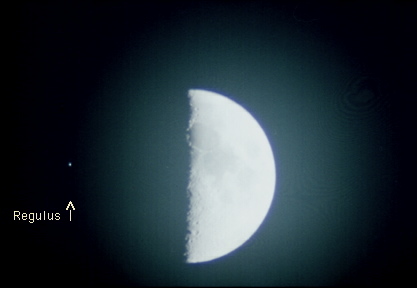 This is a rare lunar occultation of a bright star. 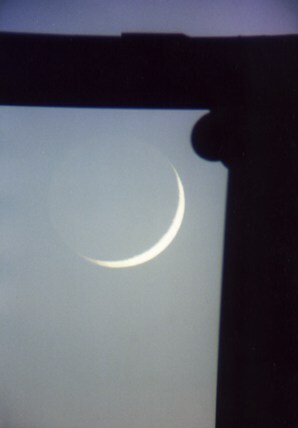 The photo shows the star Regulus about to disappear behind the moon. Here is an animation of this eclipse, made from original photos. 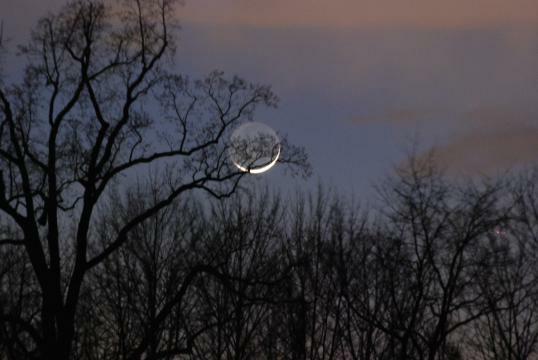 Note how the star disappears when the dark edge of the moon moves in front of it. 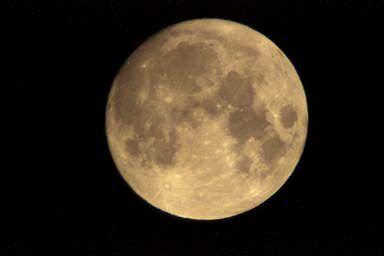 Did you ever wonder how people can see different images on the face of the full moon? Here is a page showing some of these images. 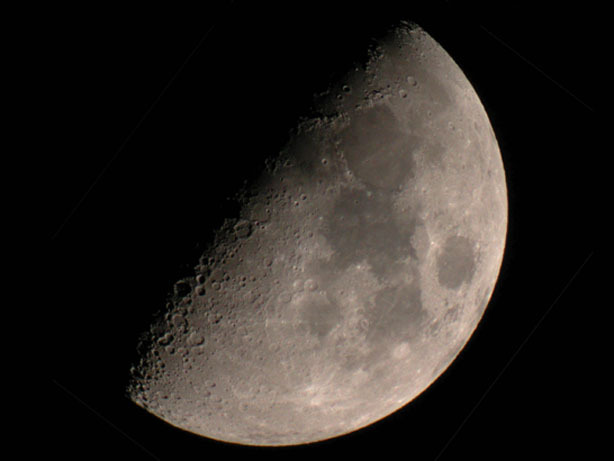 Did you know that below the equator the moon is upside down and travels backwards ? 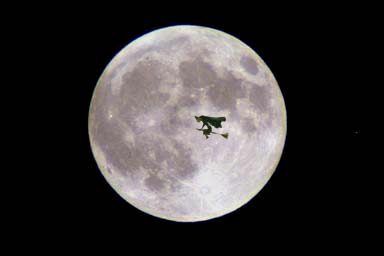 Yet you can still see the "man in the moon." Check out this page to see how. 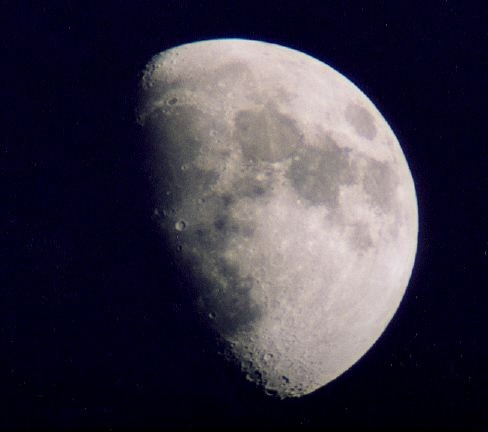 It is an optical illusion that the moon appears larger on the horizon than when it is high in the sky. 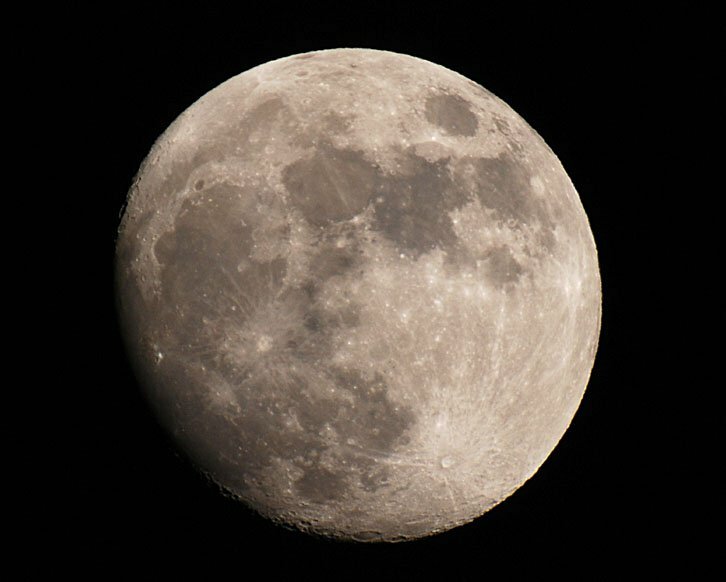 If you place your thumb and index finger a pencil width apart and hold it at arm's length, you will always be able to fit the moon between them no matter where it is. It's simply a matter of perspective- the moon looks bigger next to a tree than when it is overhead and surrounded by black. You'll never know what you might see on Halloween night. (Find out the source for this picture). Visit my award winning Photo Gallery for more extraordinary photographs. or download some free desktop pictures from my collection. at a super-fancy debutante ball! Note: These pictures are free only for non-commercial use. Any other use requires special arrangements.